For the past three installments we have sampled a rich portion of Newark’s sculpture. In future installments, we will visit other historical monuments. Today, however, let’s concentrate on yet another form of recognition of past accomplishments—the host of historical and commemorative plaques, tablets, and memorials throughout the city. Because sculpture tends to be three-dimensional and plaques two-dimensional, there are many more plaques, if for no other reason than cost. Fortunately, Newark has been blessed with an abundance of both. If you walk around town and read the memorial inscriptions, you will find they concentrate on a variety of topics such as personalities , buildings, historical events, and personal accomplishments. Truly, a reading of the city plaques is like reading a great outdoor textbook. An inventory of historical markers made in the summer of 1991 and 1992 reveals more than 200 hundred entries. Some plaques were placed by individuals or institutions, and others were generated by groups such as the Newark Schoolmen's Club, the New Jersey Tercentenary Commission or the Newark Preservation and Landmarks Committee. The latter organization continues to this day recognizing important local sites. In compiling the inventory, a search was made of the files in the Newark Public Library's New Jersey section. A questionnaire was devised, each site was or is in the process of being visited, and a check of the condition of each marker and the building on which it was placed was made. The listing is alphabetical and topical, classified by topics such as African-Americans, authors, education, industry, inventors and transportation, or citations dealing with wars from the American Revolution to Korea. While the listing is not a complete inventory and has not been published, it serves an important purpose for researchers examining Newark's intriguing past. A cross-section of individual listings includes entries such as Mary E. Biller, Boudinot House, Seth Boyden, Aaron Burr Sr. and Jr., Archie Callahan, Concessions and Agreements, David Burnet, Camp Frelinghuysen, Cockloft Hall, John Catlin, Moses Combs, Coursen Memorial Field, Stephen Crane, John Cotton Dana, Daniel A. Amato, the semi-centennial signing of the Declaration of Independence, Dividend Hill, and Mary Mapes Dodge. Another plaque was placed 'Honoring Eighth Ward Boys Who Died in the (First) World War.' The Schoolmen's Club was founded in 1902, and installed its first plaque in 1911 honoring John Catlin, the township's first school teacher. A reprint from The Newark Evening News in 1952 tells us that 'among the cities of America, only Newark has written its history amply and systematically in bronze tablets.' In many sections of the city you will find through these tablets almost a chronological account of the great events that have occurred in Newark. In commemorative bronzes you will find the names of notable men and women who were born or attained great achievements in Newark and contributed to the city's political, industrial and education leadership. Memorials also commemorate the city's role in wars since the Revolution, and reference is paid also to many American ideas. 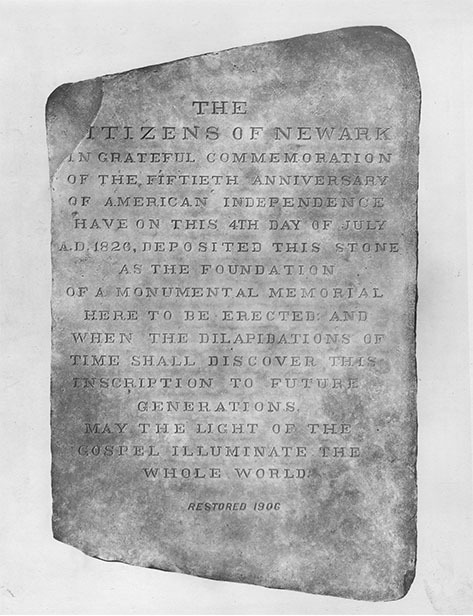 From 1911 until the 1960s approximately 50 bronze tablets were placed on city buildings, paid for by contributions of Newark school children with the inscriptions written by local teachers, librarians, and historians. Usually a plaque was dedicated on Newark Day, the 17th of May. Generally, too, a relative or person related to the subject of the memorial was invited to take part in the ceremonies. Thus Newark, because of its busy commercial and civil life, has bronze plaques in many places along its highways and streets. The tablets date to the days when Newark was a wilderness and Indians wandered all over the trails that were to become busy highways. They stretch down through the centuries revealing Newark as a pioneer city, starting with its settlement by Connecticut adventurers. And they show the ways in which its people have experimented in industry, education, science, literature and music and have given distinguished service to the city and the nation. At one point, these tablets served as a syllabus of Newark history, introduced as a regular course in the school system. Some people say that Newark was one of the nation's first cities to teach its own history on a regular basis. The Schoolmen's Club published two books about its activities, one in 1945 and an updated version in 1966 on the eve of Newark's tercentenary. From 1961-64, the New Jersey Department of Conservation was funded by the New Jersey Tercentenary Commission to erect a series of historical markers throughout the state, emphasizing aspects of New Jersey's 300-year history. In Newark, eight-foot high poles bearing shields of dark blue with white letters -the symbol of the tercentenary celebration – appeared in front of Sydenham House and Plume House, at Lincoln and Washington parks, and at Newark's two Colonial churches, Trinity and Old First. More than 30 years ago Bernie Bush, a reference librarian at the New Jersey Historical Society in Newark, who subsequently became the longtime director of the New Jersey Historical Commission in Trenton, was assigned to write text for the city's many markers. The only agency placing markers on historic sites in the city is the Newark Preservation and Landmarks Committee. One of its purposes is to recognize an important location within the community because of its architectural or historical significance by giving the viewer a brief history as to why it has been singled out for recognition. At present, 20 locations have been marked and five are under consideration for recognition by the committee. The committee has designed a 15-inch by 18-inch silver gray aluminum plaque bearing the landmarks' logo. The Plume House, for example, is depicted within a Mason jar, described in a 100-word citation. So far the plaques have appeared to be relatively vandal-free as well as weather-proof. They are tributes to many different places and historical circumstances. Plaques are designed with the permission of the site owner who decides entirely on their placement. When citing a large district or area of the city, a 20-inch by 24-inch plaque is used. In some cases plaques have been designed for buildings or sites already recognized. Most of the landmark committee's markers have been awarded to previously unrecognized locations at sites including the Watts Campbell Foundry, St. Casimir's Church, the old Protestant Foster Home, Casa Italiana, the Forest Hill Historical District, or Mt. Pleasant Cemetery. So, the next time you are catching a bus, going into an old church, visit a great government building, or turn down a new street and see a bronze, aluminum, or carved stone marker, take a minute to see what somebody has said about your city.